A pocket door between the egg retrieval procedure room and the receiving area of the embryology laboratory makes it possible to immediately transfer eggs into the lab. 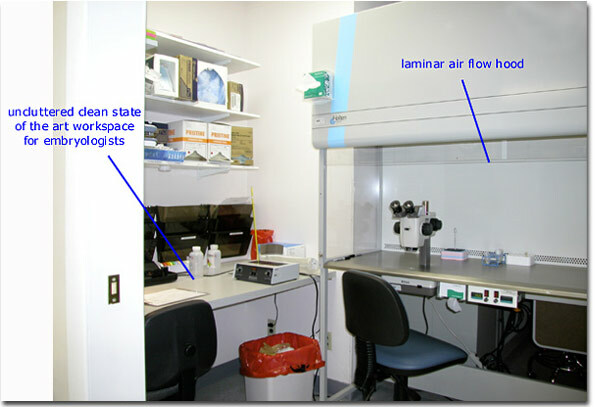 A clean uncluttered workspace is ideal for the embryologist(s). The follicular fluid that is aspirated from the ovaries is examined within a laminar flow hood. These hoods are specialized to provide laminar air flow, which is a system of circulating filtered air in parallel flow planes so as to reduce the risk of contamination (with bacteria or chemicals). Once the eggs are identified and separated from the follicular fluid they are cultured within the laboratory.